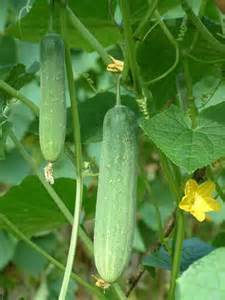 Cucumber is a gourd family Cucurbtacea known to be the best and fourth most cultivated vegetable around the world. It is a summer season vegetable which has a lot of health benefits especially for skin and eyes. Cucumber is a creeping vine plant which can be grown over trellises or you can leave on the ground. They are easy growing plants and also very easy to care and maintain. Cucumber can be grown outdoors, indoors and in hydroponic method. As this is a summer season vegetable, you can grow them all year around with hydroponics. Cucumbers comes in many varieties, Burpless cucumbers, Lemon cucumbers, Sweet Armenian cucumbers, Parthenocarpic cucumbers and Gynecoecous cucumbers. Choose the best variety for your garden. Choose the best spot to plant your cucumbers where it can receive direct sunlight for at least 6 hours. Cucumbers grow fast in warm soil. Plant cucumber seeds directly into the soil only if the soil temperature is more than 70 to 80 degrees F. Once planted the seeds water them thoroughly to keep the soil moist but not soggy. Cover them with net to protect from birds. Soil should be well-drained and slightly alkaline with pH of 7.0. Cucumber takes 7 to 10 days to germinate. Once they germinate water them frequently. Let the seedlings grow up to a height of 2 to 3 inches and then thin them. Cucumbers do not like disturbance so be careful while transplanting them. Keep only the healthy seedlings and plant them 1 inch deeply and giving space 8 to 10 inches apart. If you have a lot of space leave the plant as it is or you can set up trellis for cucumbers to climb up. Water the plant regularly do not allow the ground dry out completely. Feed your plant with basic nutrients and when they start flowering feed them with bloom enhancers. Outdoor cucumbers need not to pollinate, that work is done by natural pollinators (bees). For indoor gardening choose only dwarf varieties or parthenocarpic varieties. Parthenocarpic varieties produce only female flowers so they don’t require pollination. Choose a big container as cucumbers need lot of room to grow. Fill the pot with small stones or gravel at the bottom for well drainage. Add a mixture of potting soil and compost. Plant 4 to 5 seeds into the container and water them thoroughly. Place the container near sunny window where they can receive at least 6 hours of full sun. After 6 to 10 days the seed will germinate. Once the seedling set true leaves, separate the plants into each pot. Arrange for small trellis near the pot or insert a long stick so that the plant can climb and grow healthy. Water the plant everyday, do not over water check the soil if it is dry then water the plant. Make sure the water drains out thoroughly. Don’t allow the roots sit in water this will lead to root rot and you will end up killing the plant. If you are not able to give them natural sunlight, then place HID grow lights and make sure you provide them full spectrum for 16 hours every day. Cucumbers grown all summer long but with hydroponics you can grow all year around. Growing in hydroponic method cucumbers produce healthier and higher yields comparatively growing in soil. You can grow cucumbers in an expando drip garden, deep water culture, or in ebb & flow using Rockwool as cucumbers grow well in this systems. Cucumbers are usually very fragile and need specific care even with hydroponic growing. The best way to cultivate cucumbers in hydroponics is usually to grow them in a Rockwool. Drench Rockwool completely and drain them. Once you drain the Rockwool push the cucumber seed into Rockwool about 1/2 inch deep and water them everyday. After 8 to 10 days cucumber will germinate and will set true leaves. Start using hydroponic base nutrients. For hydroponics growing Choose European Glasshouse as it is the best and most popular cucumber variety to grow. It will take 60 to 70 days to harvest from planting. Cucumbers do best within the temperature 75 and 80 degrees F. Use HID grow lights for 16 hours per day. Place the grow lights above the cucumber plant for about 24 inches and move the lights according to the growth of the plant. Harvest the cucumbers by seeing its size, color and the firmness. Cucumbers can be picked when they are medium to dark green color and 5 to 8 inches long. After harvesting you can eat cucumber raw or make salad. Pickle it or make a soup out of it. Cold cucumber soup is best on hot summer days. Use cucumber as a facial to cleanse and to sooth your face. Venus fly trap is a carnivorous and very hardy perennial plants. They grow best in spring and in summer seasons. Venus fly trap is an easy growing plant, they can be grown indoors as well as outdoor. VFT doesn’t need much attention they grow well even if they are left alone outdoors. VFT are easy to germinate from seeds and it takes nearly 4 to 6 weeks to germinate. Purchase seeds and put them into the growing medium make sure not to plant them deeply into the soil. Keep the soil moist and ensure that the soil doesn’t dry out completely. For germination you should keep the temperature above 78 degree F up to 90 degree F. Once the seed germinate and set first two to three leaves, transplant them outdoors or in a container. Choose a right containers for planting VFT indoors. Container should be 4 inches to 5 inches in depth so that VFT roots get enough space to spread, grow healthier and better. Get insulated containers which will keep the temperature stable in hotter and colder seasons. It will also protect the soil from freezing in colder seasons. Ensure you use only nutrient poor soil to grow Venus Flytraps. Use simply pure unenriched peat moss or long fiber sphagnum moss. Nutrient rich soils and fertilizer will burn the roots of VFT and the plant will die. You can also make soil using 5 parts of peat moss with 3 parts silica sand and 2 parts of perlite. Silica sand is also known as white sand, silica or quartz which helps with aeration and also forming healthy root system of the plant. Do not use regular potting soil to grow VFT or you will end up killing your plant. Use only distilled, RO (reverse osmosis water) or rain water. Do not use any other water as the contaminates present in the water will kill the VFT or any other carnivorous plants. Always remember they should be watered only with distilled or rain water. Let your plant catch their own food for themselves, keep them outside so that it will catch on its own. If it is not possible to keep outside then feed only small insects such as ants and bugs. 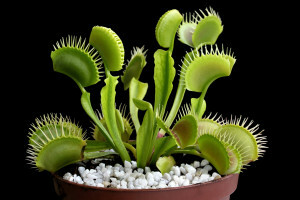 Once the VFT trap an insects they will close their trap and it will take a lot of time to open its trap. Do not try to open the trap or you will damage the plant and make sure you do not feed them meatball. Venus Flytraps are perennials so they go dormant in winter and grow back in spring. During dormant VFT looks weak as if they are died. Many more growers throw out the plant mistakenly thinking the plant has died. Dormant period last for three to five months in the winter season and the VFT shed their leaves, become weak, black and they stop growing. During dormancy reduce watering VFT plants but make sure you do not dry out the soil completely. It’s better to water them only 2 -3 times per month. Keep the plants where they can receive low light such as in garages. Do not worry about the plants growing outdoors. They will die in winter and grow back in spring. Make sure the plant should be watered to make the soil wet. Do not allow the soil to get it completely dry out and not soggy or waterlogged. It is best to water the plant and allow the medium to dry until next watering. Keep the humidity level stable by placing a tray under the container this will help the plant to keep cool over summer and winter seasons. Venus Fly Traps should receive at least 12 hours of light with a minimum of 4 hours of direct sunlight. The more light the plant receives the healthier it grows. If you are growing indoors make sure to place the plant near windowsill where they can get at least 4 hours of direct light. If sunlight is not possible for you then you can arrange artificial lights. VFT grows best under fluorescent lights and ensure that the plant get enough light to survive. Keep the plant under fluorescent grow lights as much as close at least within 8 inches of distance between the plant and the grow lights. Repot your Venus fly trap yearly once and the method is very simple. Remove you plant from current pot and remove the soil from the roots and plant the VFT in a new container with nutrient poor soil. Do not plant the VFT deeply into the soil and ensure that you have completely covered the rhizome into the soil. Water the plant until the soil gets wet this will comfort the plant from root shock and to remove any air pockets from the soil. Many pests such as aphids, mealy bugs, ants, snails and slugs eat the plants and cause great damage to the plants. There are different types of chemicals available to get rid of the plant pests, but it is not safe for our health. These powerful chemicals not only kill the harmful insects but also the beneficial insects such as lady bug, butterflies, dragonflies, spiders and honey bees. Also certain chemicals reach our bodies through contaminated food, air and water. So stop using chemicals and try organic methods to get rid of such harmful pests from your home garden. 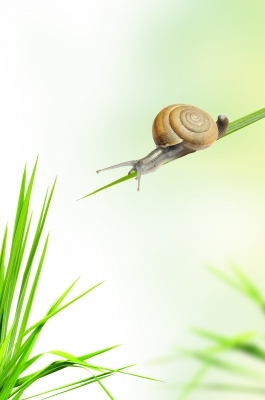 Slugs/Snails: Here are three organic method to get rid of slugs or snails from your garden. First method, use crushed egg shells and put around the plant soil, this will keep the slugs and snails away from your garden plant and egg shells becomes a fertilizer to your plants. Second method, use coffee grounds around your plants, this serve as an organic fertilizer for your plant as well as it deter the slugs and snails from your garden. Third method, use sand around your plant this will kill the snail and slug ripping its tender body. Aphids: Introduce lady bugs in your garden, it is the best way to get rid of aphids. Use pepper or garlic spray to get rid from your indoor houseplants. Another organic way to get rid of aphids is to use orange or banana peel. Cut banana peels and put into the garden soil, this will repel and remove aphids from your plant and also adds nutrients to your plant soil. Orange peel has a strong scent which acts as a natural insects repellent. Mealy bugs: Shower stream of water strongly on the affected plant and keep on repeating this process until you find no sign of mealy bugs. Swab the mealy bugs with cotton saturated rubbing hot pepper or alcohol directly over the bugs, this will help to get rid of mealy bugs from your houseplants. You can directly spray insecticidal soap or hot pepper spray on your plant and after a week rinse your plant with water. Ants: Orange peel has a natural chemical extracts which repel ants naturally. Diatomaceous earth is the best organic method to get rid of ants from your garden plant. Use cucumber peel ants don’t like to get in contact with cucumber peels. Use corn meal, ants and slugs are very fond of corn meal they eat and die due to indigestible. Powdery Mildew: Spray affected plants with the mixture of water and baking soda to get rid of powdery mildew from your plants. You can also spray milk or neem oil is the best remedy to stop mildew problems. Apply neem oil or pepper spray over powdery mildew, continue spraying till you completely get rid of them.